Even though, there remains no duties whatsoever for me to perform in this world, still there certainly does remain something to be done: to constantly serve with devotion the feet of my Teacher by whose Guidance alone I have gained this wisdom. 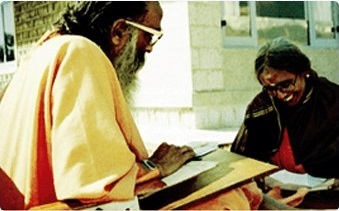 Swami Chinmayananda conceived the idea of a ‘modern day gurukula,’ to teach the philosophy of Advaita Vedanta to young men and women who would then take the knowledge back to their community. His vision was to build a group of full-time, well-educated trained preachers, without worldly ambitions or vested interests — brave and courageous — who were willing to leave personal ties and concerns behind, for a life of surrender to the Divine through service to mankind. The purpose of the residential Vedanta Course is to provide an ideal opportunity for all those who want to learn and teach. In this two-year Course, students withdraw fully from worldly life and follow a disciplined schedule of classes and activities in an ashram setting to promote learning, reflection and contemplation. Thereafter, they are encouraged to work in the field as missionaries for their own people, although this is not a stipulation for joining the Course. All Vedanta Institutes in the Chinmaya Mission are called ‘Sandeepany.’ This was a name selected by Swami Chinmayananda, after the name of Lord Krishna’s Guru – Rishi Sandeepani. The word ‘Sandeepany’ itself stands for ‘That which illumines.’ Sandeepany Sadhanalaya Mumbai, was the first residential academy of Advaita Vedanta that opened its doors to the initial batch of thirty students in 1963. Swami Chinmayananda’s direct disciples became Acharyas of forty-seven successive Vedanta Courses in seven Sandeepany Sadhanalayas, setting in motion a multiplier effect with 741 students graduating in fifty years. “Your life’s work is to discuss and impart the essence of Vedanta, and to inspire others to live the dynamic, courageous chaste life of love and dedication. Be yourself a ‘Sandeepany’ who lights the lamp of Truth in others.” – Swami Chinmayananda Studies at a Sandeepany Institute are intense and intensive. Fully dedicated to the disciples’ spiritual education and growth, the two-year residential course is standard in its syllabus and traditional in its teaching method. Swami Chinmayananda knew that the curriculum of the Vedanta Course had to be well-rounded to develop both the head and the heart of the students. Since the focus of the exhaustive curriculum is Advaita Vedanta, the primary trio of the Hindu scriptures called the Prasthana-Trayi is studied. These are the major Upanishads, Bhagavad-gita, and Brahma-sutras, and they are examined using Adi Shankaracharya’s detailed commentary on these texts. To aid understanding and provide greater depth to their knowledge, students are also taught Sanskrit grammar. Training in Vedic chanting, particularly the various Suktams and the Vishnu Sahasranama, are incorporated in the daily routine. As students have to soar high on the wings of both knowledge and devotion, the coursework also includes an in-depth study of devotional texts and hymns composed by great spiritual masters. “The significance of studying at Sandeepany cannot be easily put in words. There, one can learn Vedanta in a logical progression of thought. Without that, the learning remains random, like the study I was doing before the Course. If only one could fully grasp all that is taught in the Vedanta Course — how amazing that would be!” – Brahmachari Eric Chaitanya, Krishnalaya, Piercy The curriculum is as follows: • Sanskrit and Sanskrit subhashitas (wise sayings) • Vedic Chanting • Texts that introduce and inspire: Tattva Bodha, Bhaja Govindam, Atma Bodha, Upadesha Sarah, Sadhana Panchakam, Panchadashi (Ch. 5, 10, 15), Vivekachudamani, Drg-Drshya Viveka, Aparokshanubhuti, Vakya Vritti, Advaita Makaranda, Vedanta Sarah, Sad-Darshanam, Vedanta Dindima, Hastamalaka Stotram, Nirvana Shatkam, Maneesha Panchakam, Shivapradhakshamapana Stotram and Dakshinamurti Stotram • Shrimad Bhagavad-gita • The Upanishads: Isha, Kena, Katha, Mundaka, Aitareya, Taittiriya, Prashna, Mandukya with Karika, Chandogya (Ch. 6-8), Kaivalya, Amrta-Bindu and Shvetashvatara. • Brahma Sutras (Sutras 1-4) • Devotional Texts and Hymns (some studied in-detail; some in general, with select verses): Shrimad Bhagavatam, Tulsi Ramayana (Ramacharitamanasa), Adhyatma Ramayana, Valmiki Ramayana, Vishnu Sahasranama, Narada Bhakti Sutra, Hanuman Chalisa, Mukunda Mala, and Madhurashtakam • Other Texts: Yoga Vasishtha, Tapovana Shatkam, Purusha Suktam, Jivanmuktananda Lahari, Manah Shodhanam, Bhakti Sudha, Dhyanasvarupam, Maya Panchakam, Kaupina Panchakam, Svarupa Anusandhana Ashtakam, and Dhanyashtakam. “In this work of yours, if your sadhana is not continuous, you will be unnecessarily wasting your time, the public’s time, and the public’s money. Your words will have no effect at all unless you are regular in your contemplation, meditation and private study.” – Swami Chinmayananda. 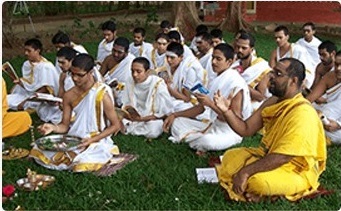 Spiritual seekers, regardless of their upbringing and faith, are carefully selected and interviewed before being accepted to undergo the intensive, residential training in Vedic literature. Obtaining consent from near and dear ones is very important, as the Chinmaya Mission does not want anyone to forsake their primary duties in life. Married couples, householders and senior citizens, who wish to join Sandeepany as guest students, require special permission of the course Acharya.